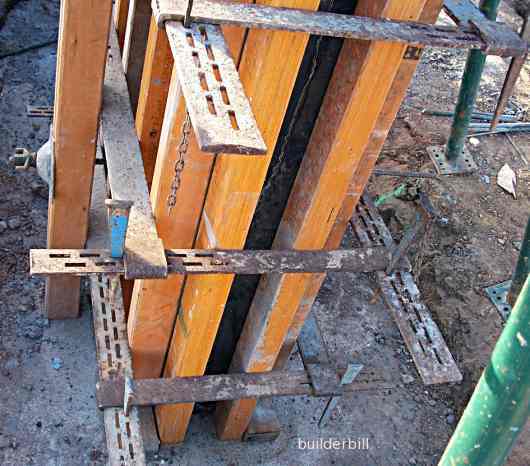 Various methods of clamping and holding column formwork in position. Above is a column form using steel clamps to hold it all together. The clamps are rested on nails while being assembled. The position of the hooked and wedged sections of the clamps is alternated with each clamp up the column. This is to stop the column form twisting and care is taken to tighten each of them evenly. The sketch on the right shows an old "low tech" method of clamping wooded forms with timber yokes, bolts and wedges.